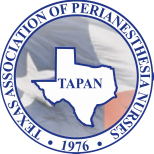 The TAPAN Star Award is presented at the Annual State Conference to members who best exemplify the Mission of TAPAN through their contributions and service to professional perianesthesia nursing during the preceeding year (August 1 - July 31). Applications must be submitted by August 1 (midnight). Applications may be submitted any time during the year! Don't wait till the last minute!